Also available for download: Microsoft Word format (click here - 424 KB) or Acrobat pdf file (click here 331 Kb). 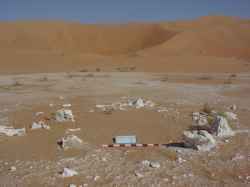 Two major 7000 year old Neolithic settlements have been found in the southeastern deserts of Abu Dhabi. This is the first time that stone structures of this period have been discovered deep in the interior of the emirate. The discovery was made by an ADIAS team working in collaboration with the Department of Antiquities and Tourism, Al Ain. Dr Mark Beech (ADIAS Senior Resident Archaeologist), Dr Heiko Kallweit (ADIAS researcher) and Dr Walid Yasin Al-Tikriti (Archaeology Adviser, Department of Antiquities and Tourism) carried out fieldwork in the Umm az-Zumul region between January 24th to February 6th 2004. Work concentrated in three areas: Kharimat Khor Al Manahil (KHM), Sabkhat Bu Dab (SBD) and Khor Al Manahil (KAM). Lithic scatters first noted at KHM by a team from the Terrestrial Environment Research Centre (TERC) of the Environmental Research and Wildlife Development Agency (ERWDA) (see last Newsletter) were revisited and then systematic mapping and collection of material was made. Mapping was undertaken of a total of 80 sites where there were significant clusters of worked flint and other stone material. In the KHM region these lithic scatters were spread almost continuously along the northern edge of the plain for more than 3km! Two significant flint scatters at sites KHM12 and KHM35 were mapped and systematically collected. 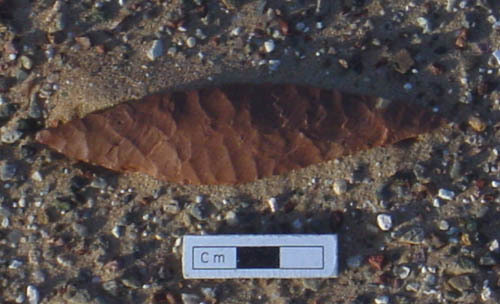 This is the first time that in-situ flint scatters have been recorded in such detail in the UAE. It will provide much important information on the technology and processes used in the manufacture of stone tools during the Neolithic period. One area of particular interest that requires further detailed investigation was identified in the Kharimat Khor Al Manahil area (sites KHM2-4). This was a large oval depression ca 120 x 50 metres in size. Nearly all of the flints noted here were collected from the terraced edge around this depression. It is tempting to speculate that the depression itself may originally have been a small water pool or lake around 6-7000 years ago, when the climate was significantly wetter than it is today. This, however, requires further geomorphological work and testing of sediment samples in the future. The most exciting result of the recent work was the discovery of two major settlement areas with surviving stone structures. No pottery was found at any of these sites but there were large quantities of Late Stone Age flints scattered amongst and around the sites. A group of three adjacent stone structures was located in the Kharimat Khor Al Manahil region (sites KHM45-47). These were round to oval shaped structures about 5-6metres in diameter whose perimeter was marked by large limestone blocks. A 4x1metre test trench was excavated through the western entrance of the best preserved structure (KHM46). This revealed that the east and west aligned entrances to the structure had substantial stone blocks set on their side, which in some cases were up to 80cm in length. The structures were built directly onto a silty sand matrix, and the blocks of stone had clearly been transported to the site, perhaps from the limestone outcrop located about 1.5km to the east. 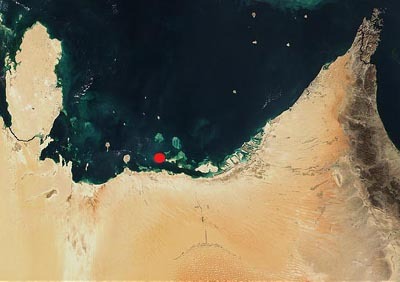 A second settlement area was also noted 7km to the NE at Khor Al Manahil. Here the structures were more eroded but there appeared to be a cluster of at least five structures (KAM3-7). A further season of archaeological fieldwork is provisionally planned by ADIAS in collaboration with the Al Ain Department of Antiquities and Tourism in Al Ain in January 2005. The results of the work carried out to date will be presented in a joint paper written by Dr Heiko Kallweit, Dr Mark Beech and Dr Walid Yasin Al-Tikriti at the Seminar for Arabian Studies conference, due to be held at the British Museum in London next July. 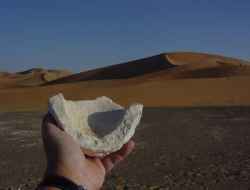 As regular readers of the Occasional Newsletter will know, an ADIAS team comprised of Dr. Mark Beech (Senior Resident Archaeologist) and Simon Aspinall (Director, Environmental Studies), carried out a brief survey of the island of Bazm al-Gharbi, west of Marawah, in December. Besides finding over 50 sites, they also collected over 400 pottery sherds from 12 sites. These have now been given a preliminary examination by our ADIAS pottery specialist, Dr. Robert Carter, of the Institute of Archaeology, University of London. Rob reports that the pottery belonged to two distinct ceramic horizons. The preliminary dating of these is the Late pre-Islamic period, and the Mid-Late Islamic period. The majority of sites (9) belong to the former horizon. Of these, 6 have pottery exclusively of that date, while three also contain Mid-Late Islamic material. Three sites were found to contain only Mid-Late Islamic pottery. The Late pre-Islamic assemblage is very closely comparable, if not identical, to one studied by Rob in Qatar (site AK2, al-Khor Island), and probably dates to the 3rd - 6th Century AD. Ceramics of this date are common in the western part of the Abu Dhabi islands region. This indicates an intensified occupation or usage of that area during the Sasanian period. Such assemblages are comparatively simple and utilitarian, and do not suggest a high degree of wealth. It remains to be established whether this pottery was left as a result of Sasanian naval activities, or whether there was a local fishing or pearling population. The Mid-Late Islamic period is represented only by one ware, of a type described in the ADIAS pottery database as Julfar Ware (Ware 2), with a rim being found that was a large example of ADIAS Type 2B, a kind of cooking pot which was used from at least the 13th to the 16th century AD. In its size and shape, it resembled vessels picked up from Ra's Ghumais, where calibrated radiocarbon dates indicate occupation during the 14th-15th centuries AD. Rob notes that the pottery assemblage from Bazm al-Gharbi is unusual in its simplicity. The island was probably occupied during the 3rd-6th centuries AD, and then again a thousand or so years later. Further research on the island and on the pottery collection is planned. This spring's Marawah season began on the 3nd March and will continue for a month until early April 2004. Excavations are being directed by Dr Mark Beech (ADIAS Senior Resident Archaeologist) and the team includes John Martin, a veteran of numerous ADIAS campaigns, as well as Richard Cuttler and Derek Moscrop from Birmingham Archaeology Unit. Richard has previously worked in both Kuwait and Qatar on Neolithic and Bronze Age coastal sites. During the 2004 season the aims are to determine the extent of the settlement at MR11. The building, which was formerly believed to be a church will be fully excavated to elucidate its ground plan. A contour map of the MR11 area and adjacent areas is being prepared with an EDM. The results of the work will be presented by Mark at the Seminar for Arabian Studies conference at the British Museum from 22-24 July, 2004, with a preliminary paper also being presented at the annual Symposium on recent Archaeological Work in the UAE, being organised in Al Ain in early April by the Zayed Centre for Heritage and History, in association with ADIAS. 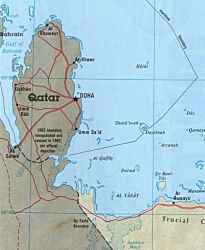 On 11th February Mark gave a lecture entitled "Recent work by the Abu Dhabi Islands Archaeological Survey" to the Qatar Natural History Group. His visit was kindly sponsored by Khalid Al Rabban, Rayyan Mineral Water Co., Qatar. The following day, Mark and Heiko met with Mohammed Said Al Bloshi, Head of the Antiquities Section of the Museums and Antiquities Department, as well as with Dr Munir Taha and other colleagues from the Department. Faisal Al-Nuaimi from the Department then kindly escorted the ADIAS team on a day trip around archaeological sites located in the northern half of Qatar, including Al Wusail and Al Khor on the east coast, Jassasiyah on the north coast, and Zekrit, Ras Abaruq and the Dukhan area on the west coast. He was an excellent and knowledgeable guide, and provided a useful introduction to the landscape and archaeology of Qatar. Special thanks go to Mohammed Said Al Bloshi and Dr Munir Taha for hosting our visit to the Antiquities Department and for organising Faisal Al-Nuaimi as our guide. Clare and David Gillespie provided accommodation during the team's stay, also arranging a trip to the Ras Abaruq peninsula to examine some of the Neolithic/Ubaid sites first discovered by Beatrice de Cardi's team in the early 1970's. Mark and Heiko also held meetings whilst in Doha with Dr Benno Boer, programme specialist with UNESCO, and formerly a botanist with Abu Dhabi's Environmental Research and Wildlife Development Agency, ERWDA. Dr Boer is responsible for Science programmes in the sub-region and implements UNESCO's Environmental and Marine Science activities. ADIAS is now working with Benno on developing archaeological projects of possible interest to UNESCO on Abu Dhabi's islands. As part of the continuing ADIAS programme of outreach to UAE nationals, our Executive Director, Peter Hellyer, visited Abu Dhabi's Zayed Private Academy for Girls on 23rd February to lecture on the UAE's archaeology, from the Late Stone Age to the Late Islamic period. Students of Grades 11 and 12 attended the talk, with those of Grade 12 having been well-prepared by their teacher Maureen Sergeant, over the two previous weeks, when she provided them with an opportunity to study books on the UAE archaeology and to trawl extensively through the ADIAS website. Much of the focus of the talk, naturally, was on ADIAS activities, including recent work at Kharimat Khor al-Manahil (see above), and the girls have now been invited to pay a visit to an ADIAS site. ADIAS was very sorry to hear of the recent death of Peter Whybrow, one of its research collaborators. One of the founders of studies of the fossils of the United Arab Emirates, he died suddenly on February 13. He was 61. Whybrow first came to south-eastern Arabia in 1979, to carry out fossil research in Qatar, on behalf of what was then the British Museum (Natural History), and later became The Natural History Museum. During that visit, he made a trip across the border into the Emirates, visiting Jebel Barakah, west of Jebel Dhanna. There he found fossil remains of crocodiles and recognised the importance of the rock outcrops in the Western Region. On another visit to Jebel Barakah, in 1981, working in collaboration with the Geology department of the Emirates University, he found more fossils, including teeth of primitive horses. He returned once again in 1984. At the time, another scientist, Professor Andrew Hill, of Yale University, was also studying the fossils of the Western Region, and the two then planned a joint programme of research. In 1989 and 1990, they worked in association with the Department of Antiquities and Tourism in Al Ain and then, for a further five years, the Whybrow-Hill team carried out further studies with sponsorship from the Abu Dhabi Company for Onshore Oil Operations, ADCO. The results of their work proved to be of international scientific importance. Over an area stretching from Mirfa to Jebel Barakah, over 100 kilometres of the UAE coastline, they found numerous fossil sites, with evidence of a wide range of animals, including early elephants, hippopotami, horses, gazelles, crocodiles, turtles and other species. These were eventually dated to around 6-8 million years ago, in the Late Miocene period. The results of their work, and that of other colleagues, in western Abu Dhabi were the focus of the First International Conference on the Fossil Vertebrates of Arabia, held at Jebel Dhanna in 1995, under the sponsorship of the Minister of Higher Education and Scientific Research, Sheikh Nahyan bin Mubarak Al Nahyan, and with the support of ADCO, this later giving rise to the major book 'Fossil Vertebrates of Arabia,' in 1999. Whybrow played a major role, not only in co-ordinating and taking part in fieldwork, but also in the associated publication programme. It was Whybrow, for example, who named and dated the two major rock formations from the Late Miocene in Western Abu Dhabi, the Shuweihat Formation and the later Baynunah Formation, around 6-8 million years old, in which the fossils were found. Largely as a result of Whybrow's work, Abu Dhabi became well-known internationally as one of the key areas in the world for fossils of the Miocene period. 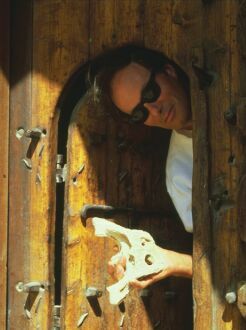 Whybrow spent most of his working life as a research scientist in the Palaeontology Department of the Natural History Museum in London, carrying out fieldwork not only in the UAE and Qatar, but also in Saudi Arabia, Yemen and Pakistan, as well as in Europe. He retired early in 2002, moving to Cornwall in south-west England, with his wife and two young sons. Ill-health, sadly, prevented him from returning to the UAE, to take part in the continuing studies of Abu Dhabi's fossils being undertaken, with his encouragement, by ADIAS. A Symposium on the History of the United Arab Emirates was held on 28th February and 29th February at the Rotana Hotel in Al Ain. The symposium was organised by the Zayed Centre for Heritage and History and ADIAS Executive Director Peter Hellyer, under the patronage of HH Sheikh Sultan bin Zayed Al Nahyan. Dr. Geoffrey King (Department of Art and Archaeology, School of Oriental and African Studies, SOAS, University of London and ADIAS Academic Director): "Julfâr: an Historical Outline". Dr King was the director of the British excavations at Julfar in Ra's al-Khaimah. Dr Robert Carter (Institute of Archaeology, University College, London): "The history and archaeology of pearling in the Arabian Gulf". Dr Carter is the ADIAS pottery specialist and his paper dealt with some of the results of his analysis of Late Islamic pottery assemblages from coastal and island sites in Abu Dhabi. Fujairah): "Historical Sources Concerning Fujairah Emirate: from the eve of Islam to the early twentieth century." Dr. Nelida Fuccaro (History Department, SOAS): "Port cities and Urbanisation in the Arabian Gulf, ca 1820-1930". ADIAS is also collaborating with the Zayed Centre on the organisation of the 2nd annual Symposium on Recent Archaeology in the UAE, which will be held in Al Ain in early April. 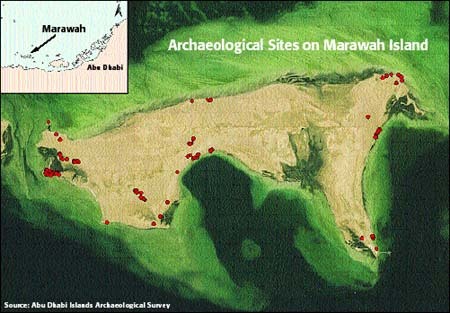 Papers by ADIAS personnel will include one by Heiko Kallweit on the south-east Abu Dhabi Neolithic discoveries, one by Mark Beech on the work under way at the Neolithic village site on Marawah, at Site MR-11 and one by Geoffrey King on the Late Islamic mosques of Abu Dhabi's offshore islands. Further sponsorship has been received by a number of Abu Dhabi-based companies for our work during the current year. Summary details follow. We are grateful to all of them for their support. Our activities continue to expand, both in the field and in terms of our databasing, analysis and publications programmes, and we would be unable to carry out as much work as we do without support of this kind. Further support is always welcome! The National Bank of Abu Dhabi (NBAD) recently provided us with a useful donation towards the upgrading of our technological support - i.e. our equipment. Archaeology is no longer a matter of spades, shovels and drawing boards - as with other areas of life, it is becoming increasingly dependent on technological innovations like computers, special computer-based mapping equipment and so on, and the NBAD donation will help to ensure that we remain up to date in this field. One of the largest recruitment companies in Abu Dhabi, ABC Recruitment, has also recently made us a donation, towards our general expenditure. Established over 20 years ago, ABC works closely with many of our major sponsors in the oil and gas industry, and elsewhere, and we are delighted to have them among our sponsors.